Apple has released a firmware update for Macs with a Thunderbolt connection. Thunderbolt allows for data transfer speeds up to 10 Gbps and is available in new MacBook Pro and iMac computers. When your computer restarts a gray screen will appear with a status bar to indicate the progress of the update. Do not disturb or shut off the power on your computer during this update. The update is also available on Apple’s website: Thunderbolt Firmware Update. 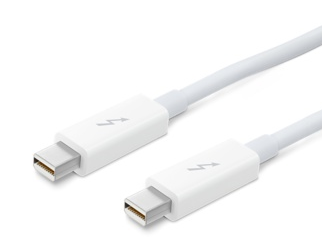 Speaking of Thunderbolt, Apple is now selling a 2 meter Thunderbolt cable available for $49.99.